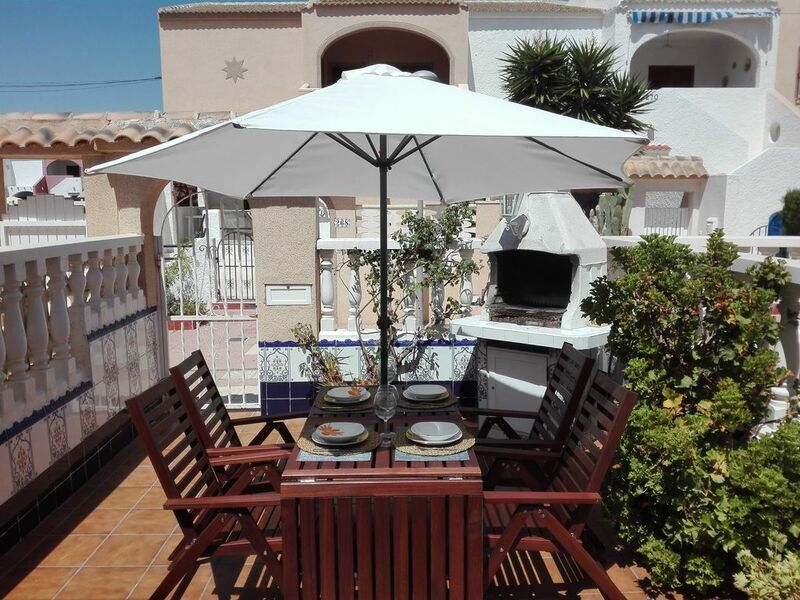 The accommodation is located in Mil Palmeras, estate belonging to Pilar de la Horadada, Alicante, 100 m from the sea and at 25m from the supermarket and pharmacy, and 200 m from the commercial area. It's a very quiet, family, residential estate, on the edge of the sea, own beach close to the Real Club de Golf Campoamor and yacht club, shopping malls, cinemas in summer, medical centers and all the amenities and services needed to enjoy your stay. It is not necessary to drive. Capacity for 4-6 people, has one double bedroom and the other with two single beds. Possibility of cradle of travel and Chair high chair type. 2 separate rooms, one interior, with two sofas, one of which converts into double bed and the porch is glassed-in, converted into a living room. It has all the amenities: 2 TVs and 2 DTT, in each lounge. DVD and stereo with turntable. Air conditioning and heating in the living room and ceiling fan in the bedroom. Radiator. Satellite TV with channels in English, French, German, Russian, Japanese, Portuguese and Polish. New kitchen with new appliances, brand new including hob, dishwasher and microwave. Also has a washing machine, drying rack, Grill, Toaster, coffee maker. We stayed here over half term in October, great location for Beach, Shop, Restaurants and Olympia Pool bar. Mil Palmeras is a lovely quiet town (Probably very busy in peak summer season). Beautiful shallow beach with great pool bar. Very safe for young children. Villa equipped with travel cot and high chair, also beach items such as chairs, and kids toys. Good patio area with secure fencing. Good wifi connection too. Well equipped modern kitchen. Great place as just off the N-332 so close to Cartagena, Murcia, La Zeina shopping mall and other sites of the area. Only niggle was bedding/sheets were a little well worn and dated, but overall great value and location for family break at the beach. Good communication with Eva the owner too. Would definitely come stay again! It's really nice place to spend your holidays. We had such a great time staying at this apartment. Owner was very helpful when we were booking,and suggesting some restaurants and places to visit in surrounding area. The apartment was clean and well equipped . Plenty place inside and enough furniture -two sofas in the dining room and one in the lounge, and terrace also has a lot of furniture to take a sunbath. Beds were very comfortable. Good and fast WiFi was very helpful. . Lovely area with some good restaurants and about 150m walk to the local supermarket and 200m to the beach.And if you have a car,you can reach different interesting places in a short time(We were in Torrevieja,Orihuela,Cartagena,La Manga with Mar Menor,Murcia and others). We had a great holiday and got a lot of impressions and plan to come back next year to this beautiful place. Dejligt hus sentralt beliggende, tæt på strand og restauranter. Alt i huset fungerede fint . Dejligt hus til 4 personer. Vi havde 10 dejlige dage med datter og svigersøn som kom flyvende fra USA de var meget imponerede over stranden og de omkringliggende byer. En dejlig tur til Valencia med overnatning samt en dagstur til Alicante er. I området er mange mindre byer at besøge med hver deres særpræg. Alle steder vi har spist har maden været veltillavet til ganske rimelige priser. Vi kommer bestemt gerne igen til huset og det dejlige vejr i september en anden gang. Cerca de la playa, ideal para descansar, descripción idéntica a la realidad. La propietaria muy atenta y Amable. Perfect apartment for family`s with children. It was plenty of space, with many rooms:-) There was a nice outdoor area, and the apartment was clean and well maintained. This house is located in a very quiet area, with everything you need in a few minutes walk. Good restaurants, food store just around the corner, lovely beach and the Olympia outdoor pool area is also a nice place to be. Very quiet, family, residential, seaside, with private beach, near the Royal Campoamor Golf Club and its yacht club, shopping centers, cinemas, medical facilities and all the amenities necessary to enjoy the room.